TODAY: The Mudcats continue a seven game home stand today with the finale of a four game series versus the Wilmington Blue Rocks at Five County Stadium. Carolina was swept in yesterday's doubleheader by Wilmington and currently trail the four game set 2-1... The current home stand will continue with today's series finale versus Wilmington and then a three game series versus Fayetteville from April 15 through April 17. ICYMI: The Blue Rocks played spoiler on Saturday as they won both games of a doubleheader versus the Mudcats and "Micro Brews" at Five County Stadium. The Mudcats fell in game one 3-2 and were shutout 6-0 in game two while playing as the Carolina Micro Brews for the first time in franchise history. The Mudcats had won four straight games before dropping both games of Saturday's doubleheader. Wilmington took a 2-1 series lead in the four game set with the twin-bill sweep and did so with a one-run edging of the Mudcats in game one and a near no-hitter against the Micro Brews in game two. ABOUT THE LAST ONE: The Mudcats were swept in yesterday's doubleheader and dropped to 2-2 in twin-bills overall this season. Carolina played its first game as the "Micro Brews" in game two last night and were nearly no-hit by Daniel Tillo and the Blue Rocks. The Micro Brews ended up getting two hits in the seventh and final inning last night and finished with two hits while losing 6-0. The last time Carolina was no-hit was on Opening 2015 when Jake Dahlstrand (6.0 IP) and Joe Gunkel (0.1 IP) combined to hold the Mudcats without a hit in a rain-shortened game on April 9, 2015. TONIGHT'S STARTER: Christian Taugner worked through a victorious quality start in his 2019 debut on 4/9 at Potomac while leading the Mudcats to a victory in game one of a doubleheader against the Nationals. Taugner a run in the Potomac half of the third, but went on to allow just the one run on three hits over six innings pitched overall. He also walked two and struck out two while earning the win in what was his first appearance of the season. Taugner finished the 2018 season with Carolina, but began the year with Low-A Wisconsin. While with the Timber Rattlers, Taugner went 7-7 with a 3.49 ERA over 22 starts and 123.2 IP. He also totaled 19 walks and 90 strikeouts while pitching to a 1.25 WHIP with Wisconsin last season. TRENDING: Payton Henry has hit safely in seven straight games and is batting .348 (8-for-23) during the streak (3 2B, 5 RBI)... Dallas Carroll began the season 1-for-9 with a walk, four strikeouts and a RBI on the road, but has gone 3-for-9 with a 3-run HR, three RBI, a walk and four strikeouts over the last three games at home. WHERE THEY RANK: Joantgel Segovia is currently 8th in the Carolina League in batting (.382) this season. Segovia is also 4th in the CL in on-base (.500), 5th in slugging (.647), 3rd in OPS (1.147) and tied for 7th in hits (13)... Ryan Aguilar is currently tied for 4th in the CL in doubles (4)... Dylan File is currently tied for the CL lead in strikeouts (15). 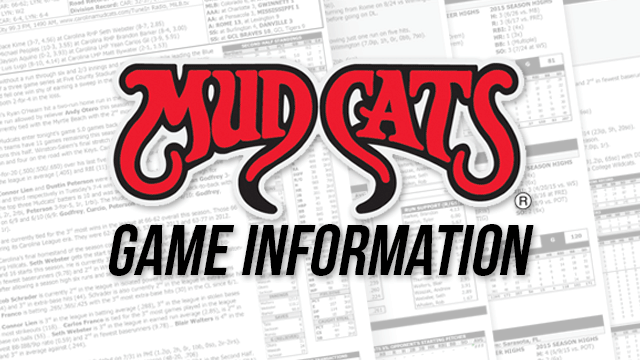 'CATS v. ROCKS: The Mudcats will face the Blue Rocks 13 times this season, including seven times at home and six times on the road in 2019. The Mudcats are 60-59 all-time versus Wilmington, including a 26-33 record at home and 34-26 record on the road. Wilmington was recently rated as the 6th most talented team in MiLB per MLB.com's Jim Callis. Wilmington's Opening Day roster including a long list of the Kansas City Royals top farm talent including RHP Brady Singer (No. 53 on the MiLB Top 100), RHP Jackson Kowar, LHP Daniel Lynch, C M.J. Melendez, 1B Nick Pratto, OF Seuly Matias and OF Kyle Isbel. ON THIS DATE: April 14, 2004 - RHP Trevor Hutchinson (6.0 IP) and RHP Kevin Cave (1.0 IP) combined to throw the third no-hitter in Carolina franchise history as the Mudcats defeated Huntsville, 5-0, in a doubleheader on April 14, 2004.